Well at least now I have your attention. Recently my Tenterfield class asked how could they use their small pieces of DSP that are left over from bigger projects. So I jumped on the net annd scouted around for some great ideas. I didn’t really have to look very far either. The girls had requested that they do a variety of cards. i.e. Christmas, kids, thank you etc. So the pics below is what I came up with. Some were inspired by others creations and some where just plain old ingenuity………..Crouch style. This is the selection of cards that the girls made. The Chrissy card on the right hand side of this pic is more of a copy than a CASE from the very talented Andrea Walford. You can visit Andrea here andreawalford.com. The close photo I took of this just didn’t focus properly so I apologise for the lack of close up, but it’s just strips of DSP cut with a border punch of your choice. Very cute and not restricted to Christmas DSP either. The next card was a kid’s card. You all know how much I love our fur babies, so decided to look for a punch art puppy. I found one done by Pat Carr from Western Australia. 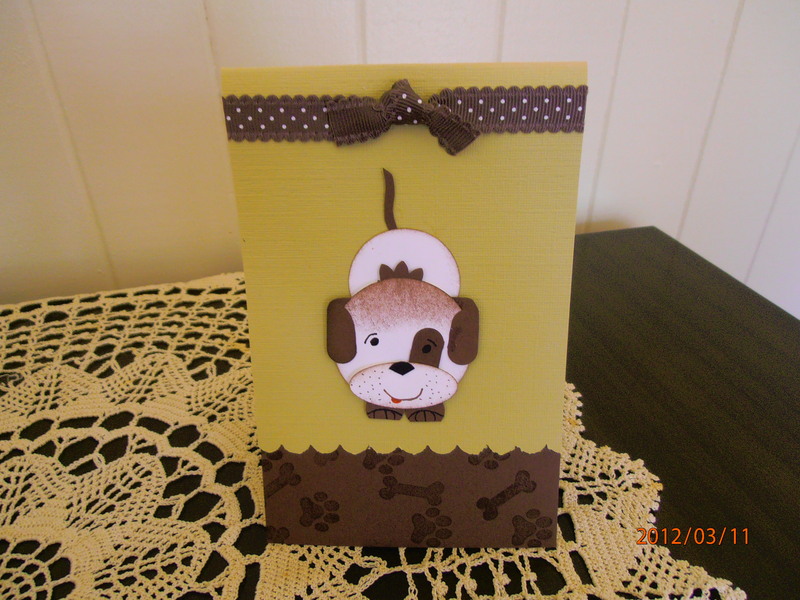 Pat made this card for the SU Regional Training day in Perth. However Pat doesn’t have a blog so I cannot link back to her. The card below was inspired by the lovely Paula Dobson who you can (and should!) 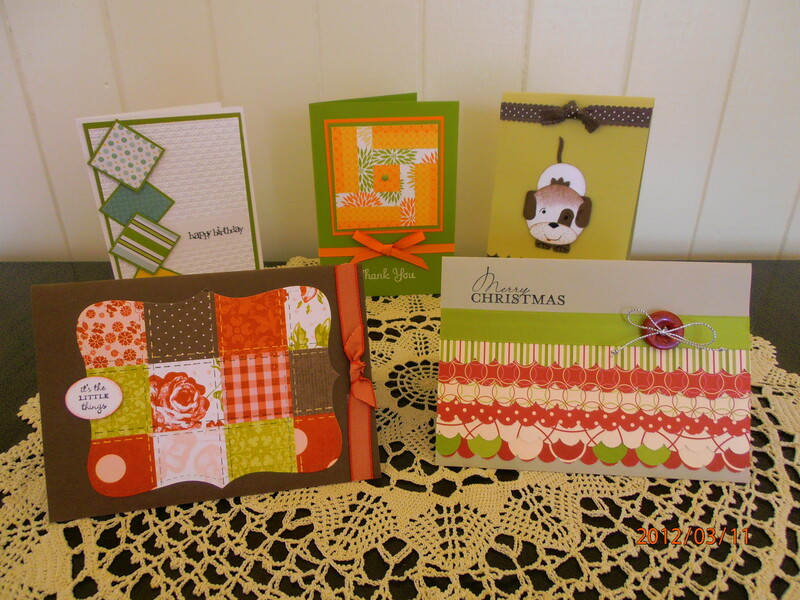 visit here stampinantics.blogspot.com.au. 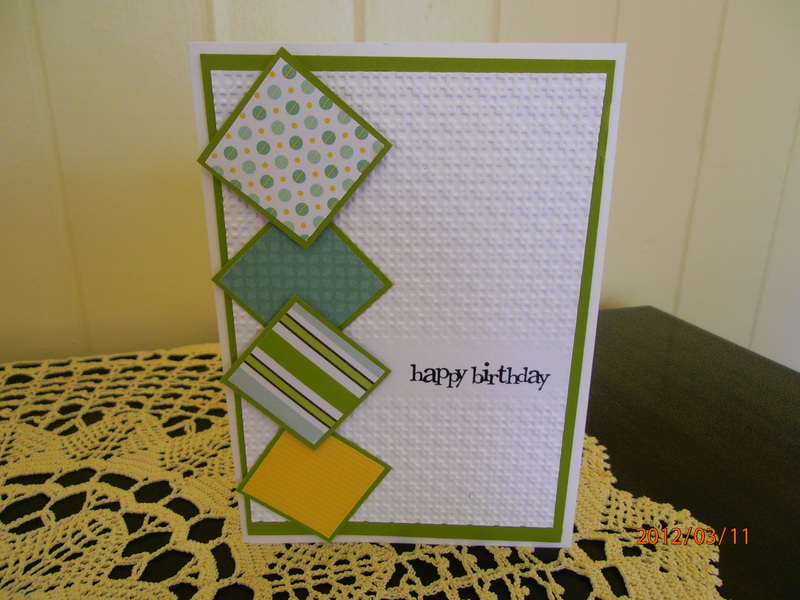 This was such a fun card to make and sooooo easy peasy. Another great way to use up tiny pieces of DSP and how cute is it? The next card was to cover the ‘bloke’ card in the selection. Using the two sized square punches and the big shot to run the lattice embossing folder, this card ended up looking really great. The final card has been around for some time, but it’s one of my faves. 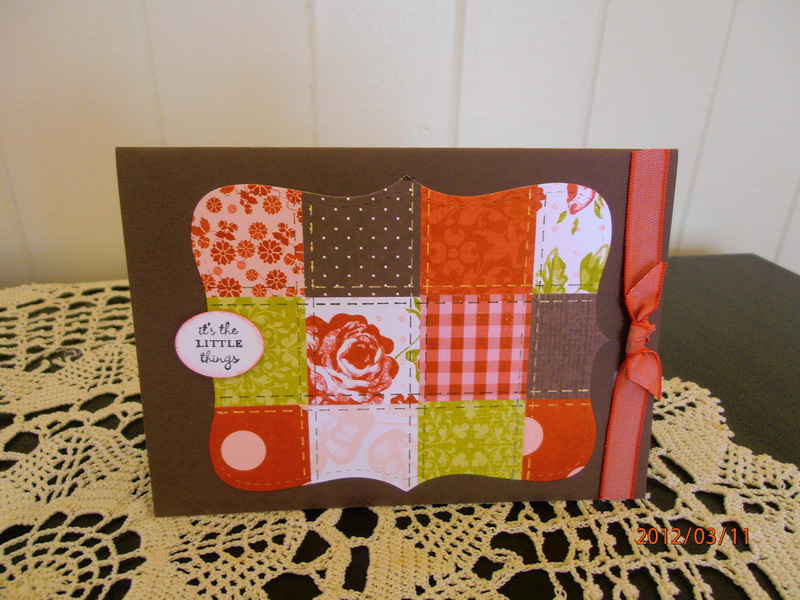 Using the Top Note Die and Big Shot together with some faux stitching, this always looks oh so quilting! I hope you’ve enjoyed our ‘bits’ class. Be sure to come on back and visit again because I’ve taken some photos of the recent Black Magic class that I did in Stanthorpe. I know you’re going to love them!